Crude oil remains confined to the $53-$55 band, where it’s traded for the past two weeks. January’s $10/bbl run-up in prices was the largest January bull market in history, so now markets appear to be taking a breather and testing whether another rally is in order. WTI crude is trading at $53.53, a loss of 48 cents this morning. 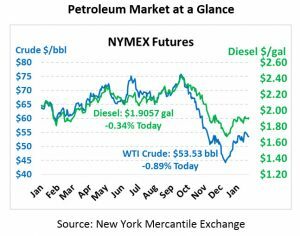 Fuel prices remain equally range bound, with diesel trading predominantly between $1.85-$1.91 since early January and gasoline locked in the $1.38-$1.45 range. This morning, diesel prices are once again bouncing off the upper limit, trading at $1.9057 after losing 0.7 cents from yesterday. Gasoline prices are falling as well, trading 1.5 cents lower at $$1.4446. Unlike the bearish API data, the EIA’s report yesterday showed a net draw across the petroleum complex, with each product coming in below the market’s expectation. Diesel in particular posted a decent-sized draw for the week, a far cry from the slight build predicted by the API. Last week’s cold snap caused gasoline demand to fall almost 500 kbpd from last week’s high level, while diesel demand rose by a comparable level. Weekly crude exports rose to the fifth highest level since the crude export ban was lifted in 2015 (2.87 MMbpd) while imports were largely unchanged – though next week’s data may show more of a hit in imports due to Venezuela sanctions. Yesterday a segment of the Keystone Pipeline was reportedly shut down due to concerns of a possible leak. Although Keystone has not confirmed the details, it appears a segment flowing from Nebraska to Illinois was shut off until testing can take place. With Venezuelan supply already cut off from the US, markets were initially concerned that another source of heavy crude was offline; however, the location of the leak suggests Canadian crude can still flow to the Gulf. Consumers in Illinois may notice higher fuel prices, though, if the outage is prolonged. 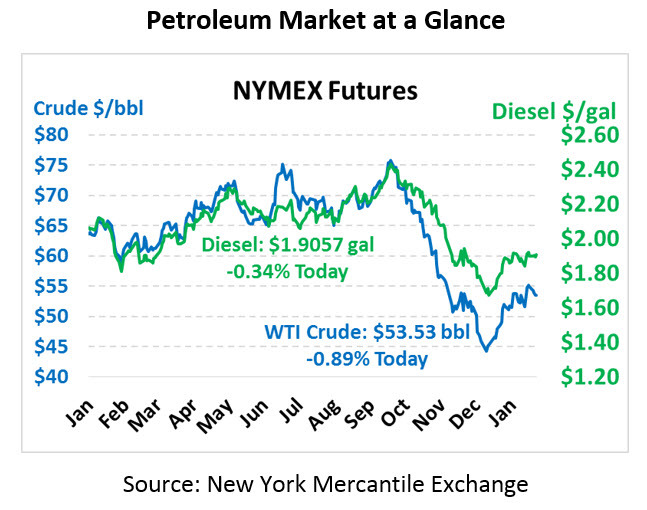 Oil’s range-bound status seems odd given the confluence of bullish factors in the market. Libya’s main oil field remains offline (300 kbpd impact), Canada and OPEC+ nations are all cutting supplies this year (combined 1.5 MMbpd impact), and Venezuela sanctions are reducing global crude stocks (~300-500 kbpd impact). IMO 2020 is quickly approaching, causing refiners and consumers to scramble to secure on-spec marine fuel. At the same time, the US economy continues running strong and is getting additional support from a dovish Federal Reserve. Although supply outstripped demand towards the end of 2018, analysts expect a return to lower inventories within the next few months, putting further pressure on prices. Overall, the rational expectation is that prices should start moving higher; but then again, who ever said the market was rational?